Ever notice those little dots around the rails of a pool table? They're called diamonds and most people think they are decorative, but good players actually use these strategically placed gems to kick at balls when they are in a tight spot. The methods used to calculate these kicks are called 'diamond systems'. For people who play 3-Cushion Billiards, these systems are absolutely essential, but they also apply on any table where the the width (short rail) is half the length (long rail). There are many different diamond systems, but the one that I use most frequently is also known as the Plus System. It involves a little math, but don't worry! It's easy. The value on the short rail is half the value of the long rail, and adding those values results in a destination. 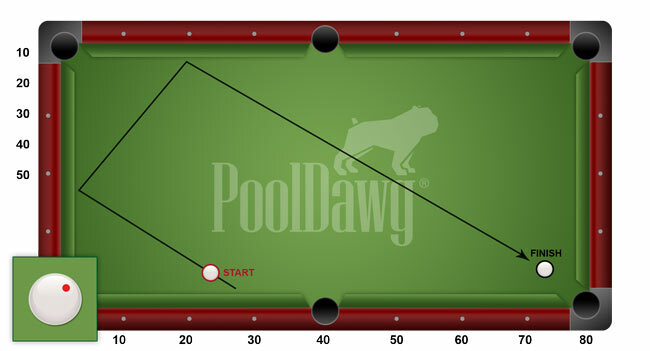 If your object ball is sitting in the pocket (80), then you find the line that the cue ball is on. 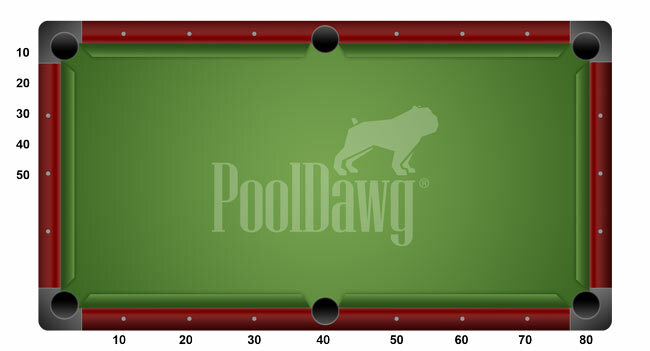 For simplicity, I have the cue ball originating out of 30 and going through 50. 30+50=80. You'll want to use a medium speed and hit this shot with about one tip of english, so make sure you grab your favorite chalk and apply some to your cue before trying this one. The number one cause of miscues is not enough chalk, so don't forget! A more difficult example is with the object ball at 65. The cue ball is originating out of 27 and going through 38. Add those numbers and you will hit your destination. To save time, I always start by finding rounded numbers that are close to the cue ball (like 30+35) then adjust until I find the exact line. People often say, "Why learn kicking systems if you can only hit it at a certain speed? ", but the answer is that once you learn the system you can also start learning the adjustments to make when you have to hit it soft, or when a ball is in the way. It will also give people who kick by feel some backup when they're not feeling it. Most people aren't willing to put in the time and effort to learn these systems, but if you do, you will never regret it. Diamond Systems will help you win in seemingly hopeless situations, and that alone makes it worth it.